Winter Wardhani, Chagal Campestre, Flor Campestre, Janjii Rugani and Wan Laryukov are not just random names. 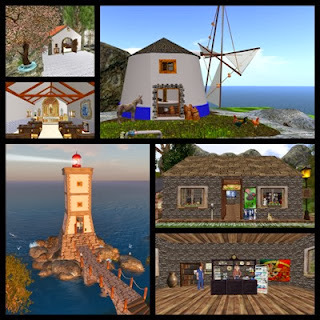 These are five people who, by fate or by chance, have met in Second Life and have teamed up by a common interest: Art! 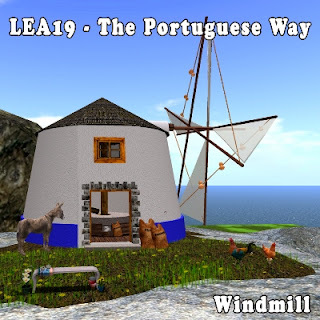 Their joint forces and ideals resulted in the birth of LEA 19 - The Portuguese Way. The Portuguese Way discloses the often forgotten small country located in the south-western corner of the old continent, famous for its beaches yet rich in history, culture and in various artistic expressions. Portugal is here presented in its pure essence, through the eyes of people who communicate through art and put their emotions and their perceptions into what they do. With a strikingly expressive and vivid architecture, with the characteristic Portuguese windmills, lighthouses and castles, the famous Golden Gate’s Bridge twin sister among other famous landmarks, LEA 19 combines the rural with the city, the ocean with the mountain: entertainment with learning, a place of contrasts resuming in an analogy to photography. We had the privilege to visit The Portuguese Way venue and to talk with Winter Wardhani while roasting marshmallows on a very comfortable campfire. SLE: Winter, why “The Portuguese Way”? Winter Wardhani: The Portuguese Way was an idea that my team and I had for some time that was to show other people that Portugal is more than Fado and beaches, that it has a rich history and culture. 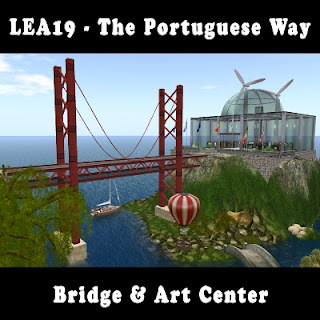 Some people in SL never heard of Portugal much, so we thought why not apply to a LEA sim? We put the Project on paper and, against all odds, it was approved, so we gathered here and started building. 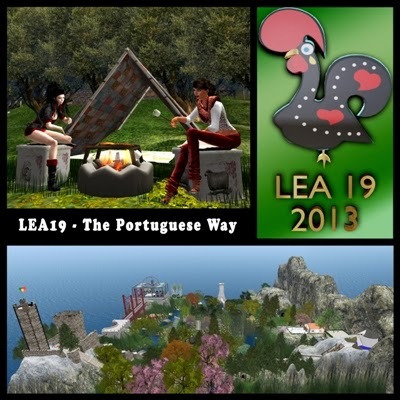 SLE: What is the foremost goal of The Portuguese Way? 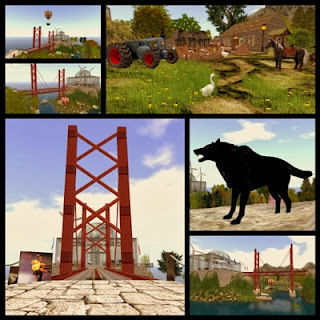 Winter Wardhani: Our main intention in building LEA was not only to show a bit of Portugal but also to have a place where people could have fun and return to hang out. Most of LEA venues have these big and wonderful surreal art installations, people go there, take pictures and don't return. We build The Portuguese Way so that people felt good here, and most people do return. Realism is a form of art and we went that way. SLE: Is the venue having a good uptake? Winter Wardhani: indeed it is. 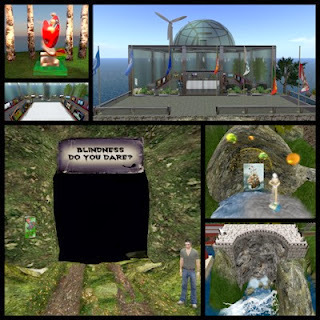 We have been having great reviews on most SL blogs and an average of 40 visitors per day since we opened. Our events have been having around 25 to 35 people. SLE: What kind of events do you host here? Winter Wardhani: we have weekly events, from concerts to performances and art exhibitions at the art center. We also hold themed photographic Safaris, including one on LEA 19 – The Portuguese Way, whose result is currently on exhibit in the art center and soon to be in my art Gallery named after me “Winter Gallery”. 43 lovely pictures! And I was quite surprised both with the quality of the pictures and the themes. When I saw some pictures I wondered "wow, is this here?" and it was. The different approaches to the theme show some of the personality of the people involved. Our next event will be on Saturday, an event dedicated to Zéca Afonso at 2PM. Zéca Afonso was a Portuguese singer famous for his music of social intervention. SLE: Each person sees Second Life in their own particular way. Winter Wardhani: indeed and that is the beauty of the safaris. The different approaches to the theme show some of the personality of the people involved, the wind light settings, the angles, the theme of the picture: tells a lot about each of them. But regarding the graphics, in my photography classes I have leant that if you have a good eye, you take wonderful pictures: even with low graphics. SLE: Could you tell us some more about the Photographic Safaris? SLE: Could you tell us about the teamwork? Winter Wardhani: Chagal Campestre is our master builder and he has high skills in construction as you can see. The sculptures are made by Wan Laryukov. I build the village and did most of the landscaping together with Wan. Janji and Wan are in charge of the performances. We are all in tune and work towards the same goal, so the team is perfect. SLE: What can people find in the venue? Winter Wardhani: We also have an installation called blindness as a tribute to José Saramago, a Portuguese writer and Nobel Prize winner. Our inspiration came from his book Blindness. It is a totally dark maze where you can feel the sensation of being blind. It is weird how virtual blindness can arise feelings in you: first you are curious, and then you get mad because you cannot find the way out, then you are desperate and totally lost. Some people try till the end while others just get out of there as soon as they can. Also, around the island there are lots of notecards with information on Portuguese History, culture, fauna and flora. You will also find souvenirs like postcards from Portugal or the famous Galo de Barcelos that is our national symbol. In the art gallery some of the most famous artists in all fields are on display. Besides that, people can go sightseeing; have a hot air Balloon Tour, attend our events or just relax in the many cozy areas like this one, the campfire. SLE: Thank you so much Winter for agreeing to talk with us and for this pleasant moment. If you’re looking for a real memento of the venue, we challenge you to visit it from the perspective of a photographer and capture your visit with the camera. And do contact Winter Wardhani to have your photographs displayed at the Winter Gallery.